When I noticed that Hells Headbangers dropped me an EP from the band October 31 I was immediately interested in hearing what the band had to offer. I had first encountered the band when they did a cover of Iron Maiden’s ‘Public Enema Number One’ back in the 90’s on a tribute album I purchased and thought they seemed interesting. When I first encountered the band, what I first noticed was that the drummer, King Fowley, was also the vocalist which is a rare thing. So other than the cover song I heard back in the 90’s I never had known much about the band or had a chance to hear other material until now with the new EP ‘Gone to the Devil’. 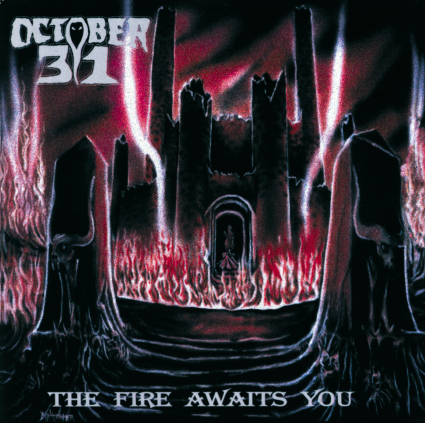 As a bonus treat to celebrate October 31’s upcoming new album in 8 years Hells Headbangers has also decided to reissue two previous releases from October 31, ‘The Fire Awaits You’ and ‘Meet Thy Maker’ both of which are chocked full of bonus tracks. So I thought what better time to dive into the band and hear what October 31 and King Fowley was all about! ‘Meet Thy Maker’. What a difference a few years can make for a band! Listening to ‘Meet Thy Maker’ was like night and day. Fowley’s Voice is much stronger on this album; the songs are more together and also have nice composition. Musically you have nice leads and riffs that really help the songs have a life of their own. This album is so much improved upon from their debut album it would almost be a whole new band in terms of creativity. Well worth a listen. The songs are much much stronger and the band seems to hit a stride of where they know how to better compliment each others musical strengths. It should also be noted these releases come with bonus material of some cover songs and the EP ‘Visions of the End’ which also contains some GREAT material such as ‘The Legend of the Haunted Sea’ and ‘Servants and Slaves’. 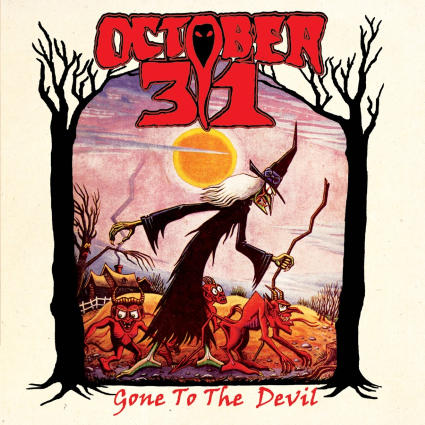 Also, October 31 has done a decent amount of cover tunes such as Lizzy Borden’s ‘Give ‘Em the Axe’, Iron Maiden’s ‘Public enema number One’ and Ozzy’s ‘I Don’t Know’ among a host of others. With the cover tunes October 31 really showcase their playing ability and do a good job with all of them especially the Lizzy Borden song as the vocal style of Fowley is very different from the original and it was interesting to hear this version. Now we come to the 2 song EP ‘Gone to the Devil’. It has been 8 years since a release of any kind from October 31 and this EP marks a promise of a forthcoming LP. The EP has one original song, ‘Gone to the Devil’ and yet another cover this time a Uriah Heep cover ‘Too Scared to Run’. Again, it seems time has favored the band in terms of them maturing as musicians as the song, ‘Gone to the Devil’ is a very strong song with Fowley’s vocals sound much stronger than on some previous material and the band musically making a song come together. As for the cover song, again October 31 to a cool rendition from a classic band and make it their own. If there were negatives to be said about these releases or the band in general is that they have that signature ‘Underground’ sound which means something that will sound rough and unpolished that some people will not like. For me, such a sound can give a band a certain edge lost in a fancy studio. In October 31’s case it hurt them in their first recording but with their future releases becomes somewhat of a sound that helps identify them as a band. 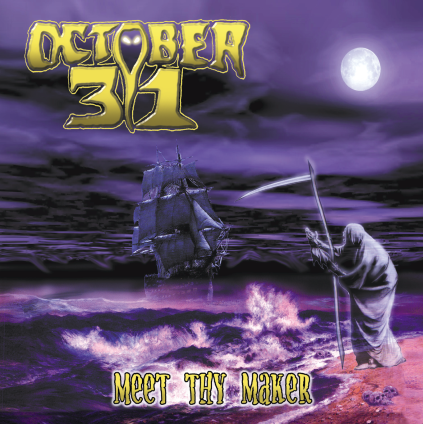 So just from the one song on the EP I really look forward to hear how much more October 31 has progressed musically from their previous endeavors as I really enjoyed ‘Meet Thy Maker’ and I recommend when the re-issues come out you check it out. As for ‘The Fire Awaits You’, unless you are a complete freak and have to have everything from a band I would probably give it a pass.